Named one of the Best Books of 2017 by: NPR, BuzzFeed, The Atlantic, The Washington Post, Chicago Tribune, Rachel Ray Every Day, San Francisco Chronicle, Vice Munchies, Elle.com, Glamour, Eater, Newsday, Minneapolis Star Tribune, The Seattle Times, Tampa Bay Times, Tasting Table, Modern Farmer, Publishers Weekly, and more. Samin Nosrat is a writer, teacher, and chef. Called “a go-to resource for matching the correct techniques with the best ingredients” by The New York Times, and “the next Julia Child” by NPR’s All Things Considered, she’s been cooking professionally since 2000, when she first stumbled into the kitchen at Chez Panisse restaurant. She lives, cooks, surfs, and gardens in Berkeley, California. Salt, Fat, Acid, Heat is her first book. Wendy MacNaughton is a New York Times bestselling illustrator and graphic journalist whose books include Meanwhile in San Francisco (Chronicle), Pen & Ink (Bloomsbury). The Gutsy Girl (Bloomsbury), and The Essential Scratch and Sniff Guide to Becoming a Wine Expert (Houghton Mifflin Harcourt). Her work appears in publications like The New York Times, Lucky Peach, Bon Appétit, AFAR Magazine, and elsewhere. She is the back page columnist for The California Sunday Magazine. "Just reading Salt, Fat, Acid, Heat will make you a better cook, adept at seasoning, balancing, understanding what it really is you’re doing and why... Make room on the bedside table—and the countertop." "I talk about Salt, Fat, Acid, Heat the way people talk about beloved pets or newborn babies; like I was a different person before I read it – and I was. I liked to eat, but hated to cook. I was a huge proponent of what I called "snack dinner," basically whatever I had that didn't require a cooking implement. Samin Nosrat (and illustrator Wendy MacNaughton) set me straight. Together they debunk the concept of recipes, instead teaching you how to build food (and flavor) from scratch and by instinct. Salt, Fat, Acid, Heat uses its eponymous guiding principles to chart a very delicious course toward never eating snack dinner again." "My favorite metacookbook...[Nosrat] offers a beautifully simple checklist for ensuring a dish ends up in a good place...This is the book of cooking grammar that so many novices would benefit from...Salt, Fat, Acid, Heat is written smoothly and casually, and kept breezy via charming watercolors by the perceptive Bay Area artist Wendy MacNaughton...Nosrat’s book would be of value both to people who don’t consider themselves cooks and to people actively striving to become better ones." "Inventively illustrated...ambitious...[Nosrat is] a talented explainer." "A cookbook that will make you a better cook...with helpful, charming illustrations from artist Wendy MacNaughton." "An exhaustively researched treatise on the four pillars of successful cooking." "Hundreds of cookbooks are published each year. Some are good. Others are exceptional. A few are essential. 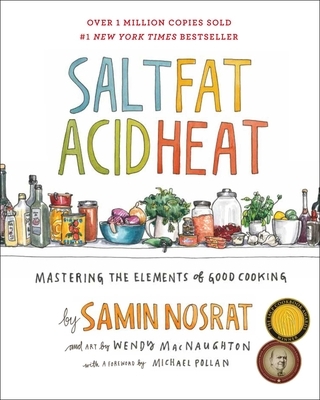 Samin Nosrat just published “Salt Fat Acid Heat — Mastering the Elements of Good Cooking” and I daresay this one is essential...That’s the fabulous thing about this book — it teaches readers about cooking, how to employ various techniques, and how to grasp that any subtle variations in technique can have significant impacts upon our end results. It is possible to learn how to cook great food...This book is bound to become an indispensable addition to cookbook shelves throughout America." "Nosrat’s beautiful, approachable book demonstrates how these four are the only elements necessary to make delicious meals anywhere, any time." "Provides the cook with far more tools for branching out and exploring their own creative potential - and that makes it a standout." "An excellent cookbook and culinary resource that pares down the idea that it only takes four ingredients to make food taste amazing." "The kind of cookbook that will certainly make anyone who reads and absorbs all of her shared food tidbits a better cook and, perhaps, an engaging conversationalist." "The cookbook, with its instructive recipes and playful illustrations by Wendy McNaughton, is an enjoyable and approachable culinary master class." "The book amounts to an incredibly engaging master class that helps free you from recipes so you can improvise like a pro. Nosrat’s approach is foundational yet innovative: distilling the essence of cooking into four main concerns. With a full understanding of how each element effects flavor and texture, a home cook can easily extrapolate and apply these principles to unfamiliar ingredients or dishes and still cook with confidence...The curious cook will eventually find her copy of this book stained and dog-eared, as she consults its essential kitchen wisdom for years to come." "[This book] will be valuable for either a beginner or a seasoned cook. Unlike similar manuals, Nosrat’s volume has hit upon a theory not only easy to remember, but also fun to learn in practice. Even more fun: the accompanying art by Wendy MacNaughton, which illustrates flavor wheels and pairing matrices." "In the days after reading Samin Nosrat's new book, Salt, Fat, Acid, Heat, eating felt like a new adventure...And when it came time to cook simple meals, the raw carrots and greens in my fridge looked less intimidating: I had new tools to tame them...Inspiring this sense of culinary liberation was precisely Nosrat's goal with her cookbook, which eschews formulaic recipes in favor of heartfelt stories, bits and pieces of science, and time-tested nuggets of kitchen wisdom (not to mention gorgeous and witty watercolors by the prolific Wendy MacNaughton)...boy, does Nosrat deliver." "Most cookbooks are filled with recipes, with or without a central theme. That’s what a cookbook is for, right? A recent batch of cookbooks...have turned this notion on its ear, aiming, instead, to better prepare home cooks to build weekly menus and avoid food waste...the best book to come out of this new trend is, to my mind, Salt, Fat, Acid, Heat: Mastering the Elements of Good Cooking by chef Samin Nosrat, with whimsical illustrations by Wendy MacNaughton. The book tackles each topic in its title in turn, showing how they contribute to great cooking, then offers experiments, recipes, and other ways to apply your new knowledge. It’s not just a good cookbook; it’s a good book, period." "All you need to master the kitchen are the four elements laid out in this Joyfully illustrated book's title. Nosrat, who's been called 'America's next great cooking teacher' by Alice Waters and taught Michael Pollan how to cook, is a more than trustworthy instructor." "If there’s one cookbook that will make dad want to march into the kitchen and start cooking you amazing meals, it’s this one." "Salt, Fat, Acid, Heat is a refreshing break from [the] contemporary formula. Instantly recognizable as a reference book, Samin Nosrat's definitive technique-driven tome defies convention. This is partly because Nosrat's method of teaching via the book's four main pillars (salt, fat, acid, and heat) is a rarity...But what makes Nosrat's method so effective was her insistence that the book be illustrated. "A gorgeously illustrated guide that will make you much more confident in the kitchen." "California chef Samin Nosrat explains how these four elements affect everything we cook and eat, then rewards faithful science students with recipes for a perfectly balanced Caesar salad, a flaky pie crust, and fall-off-the-bone braised beef." "Rarely does a cookbook make you feel like its author is right there in the kitchen with you, teaching you not how to make recipes but how to actually cook." "NPR once called Nosrat 'the next Julia Child.' Based on her first cookbook, we can see why. The Chez Panisse alum uses a simple philosophy: balancing salt, fat, acid and heat (temperature, not spice) to create a perfect finished product. But recipes aside, the illustrations alone are worth the price." "In the Bay Area, writer and chef Samin Nosrat has cult followings both for her pop-up dinners at Tartine Bakery in San Francisco and her cooking classes, which friends swear have changed their time in the kitchen...This is a new kind of book. Lots of words to live by before you get to her kitchen basics and, finally, recipes more than halfway through. Wendy MacNaughton’s delightful illustrations capture Nosrat’s infectious joy for the subject. Just reading Salt, Fat, Acid, Heat will make you a better cook, adept at seasoning, balancing, understanding what it really is you’re doing and why." "Beautifully illustrated and super informative." "Nosrat’s lighthearted approach and whimsical illustrations in Salt, Fat, Acid, Heat: Mastering the Elements of Good Cooking will teach you how to make delicious food anywhere with any ingredients, even without a recipe." "Part textbook (in the best way possible), part master recipe guideline and inspiration. And filled with Wendy MacNaughton’s cheeky hand drawn illustrations. The entire first half of the book is Samin being Samin – an incredible teacher and guide, with infectious enthusiasm for food, good cooking, and good eating. While I consider myself an adept cook, each section was filled with new easy ways to think about cooking – written in a manner that would teach and inspire novice and expert alike. How she *actually* manages to pull this off, I have no idea – this is so hard to do and it’s brilliant. " "Ever wish an acclaimed, professional chef would reveal the building blocks of great cooking? Well, here you have it. Chef and writer Samin Nosrat got her culinary start at Chez Panisse restaurant and has schooled scores of people, including author Michael Pollan, on how to cook. Now she’s distilling her approach for us all." "Want to be not just a good cook, but a great one? Then this groundbreaking book from Samin Nosrat will help you master “the four notes of the culinary scale” giving you a whole new perspective on how you structure and create a dish." "Nosrat discovered the secret behind great cooking—not memorizing recipes, but knowing the balance among four key elements: salt, fat, acid, and heat. Nosrat invites readers to learn what it takes to master these components and take their cooking from good to great...MacNaughton's illustrations add a touch of whimsy to the text, highlighting the techniques and skills presented in a clever manner. A fun, educational addition to all collections." "As Nosrat understands, the elements of good cooking couldn’t be simpler. Success in the kitchen depends on just four elements: salt, fat, acid, and heat...Culinary students and serious home cooks can discover from both text and drawings how to succeed through fundamentals of their craft." "For those who'd rather wing it in the kitchen than follow a recipe, this book's a great way to learn how to do this with confidence...I loved this book. I mean, I LOVED this book, so much that I couldn't put it down." "Chez Panisse veteran Nosrat has reduced her cooking philosophy to her first cookbook’s titular quartet of elements. The book’s core 100 recipes (and scores of variations) form an intuitive tutorial that can be applied to nearly any ingredient in the pantry." "In her excellent first cookbook, Nosrat distills what she learned into a manual for intuitive and improvisational cooking, focused on the four key components in her title. In this vital book, Nosrat demystifies the kitchen, explaining in friendly, confident terms why and how salt and fat enhance and build flavor, respectively; the effect of acidity in balancing out a dish; and knowing how to control heat and thus, the finished dish. You’ll be empowered to cook bravely." "From these four strands, the former Chez Panisse weaves a wholly original —- and highly idiosyncratic —- book, half of which is instruction, half recipes. The two-page spread on pasta alle vongole, for example, is both “a lesson in layering acids” and an exacting recipe. The whimsical but hardworking illustrations, by Wendy MacNaughton, are every bit as original." "[Nosrat] writes with great wit. We need more cooks like her." "A thorough but engagingly intimate graduate course in the four most transformative tools in the cook’s arsenal. Understanding how the elements of a dish aid in its metamorphosis equips cooks to make the most of any ingredients. Its thoughtful explorations make it impossible to read without becoming a better cook." "Beautiful, useful, and filled with illustrations from Wendy MacNaughton, whose prolific illustrations are instrumental in demonstrating the intricacies of cooking." "If you're only going to buy one cookbook this year, let it be this so-much-more-than-a-recipe-book by Chez Panisse alum Samin Nosrat and illustrated by Wendy MacNaughton, guaranteed to turn even the most culinarily inept among us into kitchen proficient." "With Nosrat’s sharp insights and Wendy MacNaughton’s playful illustrations as a guide, the readers of this book will develop essential cooking instincts." "Salt, Fat, Acid, Heat is like going to culinary school through the pages of a book, learning from a really fun, smart, and brilliant teacher who imparts kitchen wisdom to last a lifetime. Once you read this special cookbook, your confidence level in the kitchen will skyrocket." "This book is basically a bible for novice chefs." "An approach to food science that's both accessible and entertaining." "The perfect tool for ushering the culinarily curious but timid into the world of badass home cooking." "Salt, Fat Acid, Heat bridges the gap between home and professional kitchens. With charming narrative, illustrated walkthroughs, and a lighthearted approach to kitchen science, Samin demystifies the four elements of good cooking for everyone. Featuring 150 illustrations and infographics that reveal an atlas to the world of flavor by illustrator Wendy MacNaughton, Salt, Fat, Acid, Heat will be your compass in the kitchen." "The best cooking primer since Julia Child’s famous tomes."